What Is Capitation Fee In Healthcare? US healthcare is researching ways to tackle the challenges of lowering costs and improving the quality and the outcome. The traditional, age-old Fee for Service model is under scrutiny for being expensive and for focussing on rewarding medical providers for volume and quantity of services rather than the results. Within the current fee-for-service system there are incentives for performing unnecessary services. A vast majority of healthcare is paid for on a per-piece basis, where a healthcare provider is paid more for doing more. This type of payment leads to fragmentation in the healthcare sector. The most effective strategy for curtailing this financial drain is to adopt a population-based, Capitation model. So, what is capitation fee in healthcare? Capitation Fee is a kind of healthcare payment system in which a physician or hospital is paid a fixed amount per patient for the agreed period by an insurer or physician. It is an effective alternative to Fee-for-Service (FFS) in certain situations. Capitation fee in healthcare is a settled amount of money per patient per unit of time waged in advance to the physician for providing healthcare services. Managed care organization use capitation payments in order to control the costs of care. This payment system regulates the use of healthcare assets and put the physician at the financial risk for services delivered to patients. Capitation model is a system based on the quality measured by health consequences, patient approval, and clinical compliance. The capitation fee in healthcare is usually based on the percentage of the premium which the health plan receive per member per month (PMPM), or is based on average cost per members on a specific population. The PMPM amount is resulting from different factors which include age, gender, incomes, location, and residence of a patient. In this medical billing system, a physician collects a PMPM irrespective of the services performed or how costly those services might be. PrimarPrimaryacy care physicians receive the payment for their patients from their HMO. Secondary: Secondary providers take capitation payment according to the number of patients. Global: Provider is reimbursed by PMPM according to the total number of members in the network. Capitation model creates incentives for efficiency, cost control, and preventive care. The capitation system is a stable payment model, offering a monthly financial guarantee to providers (primary care doctors, specialists, and hospitals), whether patients seek care or not, and provide financial certainty to payers (insurance companies) regarding the costs involved to manage the health of patient populations. The key benefit for physicians is the decreased costs of bookkeeping. Physicians do not have to maintain a billing staff nor does the practice need to wait to be reimbursed for their services. Relieving these hassles and costs allows a practice to be more productive and treat patients at a lower operating expense. Capitation model discourages PCPs from delivering more or conduct unnecessary procedures thus alleviating the risk of excessive medical billing. Capitation also boasts innovative and preventive service delivery methods like telemedicine etc which increase patient trust and satisfaction. Charging patients on the basis of quality rather than the quantity, inspire healthcare providers to provide comprehensive and value-based care. It provides a certain estimation of cost for the payers and gives a predictable monthly cash flow to the physicians. Capitation further simplifies medical billing and coding which are associated with each visit and procedure. Capitation fee in healthcare system holds many advantages but it has its own limitations. This model creates a situation where providers may choose to save money by implementing less costly procedure and drugs instead of a more reliable one for the same service. This might create disparity among providers and pharmaceutical companies. There is also an ongoing discussion on whether capitation is fiscally viable in all situations. In areas with higher population such as California, some providers receive low capitation rates from IPAs, which drive them to settle down with FFS method in addition to capitation. This payment model will compel doctors to register as many patients as possible, leaving less time to actually attend a patient. To increase profits, a medical practice might change its ways to treat patients or initiate policies which eliminate procedure to which a patient is eligible. The doctors might also avoid patients who are expected to have high per capita costs during the capitation contract. This is often called as healthcare rationing in which the level of overall care is reduced to achieve financial profits. In this method, a patient’s wellbeing risk might increase because of deferred care beyond the prepayment interval. With this payment system, the physicians’ individual financial risk can be extraordinary if care of the complex or chronically ill patient is considered. The patients will chronic disease will surpass the allotted amount which in turn will create risk for the physician. It could also result in physician avoiding those which multiple comorbidities or high-cost conditions. Capitation has now developed as an upcoming form of providing healthcare payment by the health plan for medical care. Medicaid and Medicare have been using this medical billing system for decades. The traditional FFS system is also moving away because of the rising cost of diagnostic procedures, lab tests, and medications. The capitation medical billing system is recognized as a stable and financially certain model, offering a monthly financial guarantee to providers (primary care doctors, specialists, and hospitals). PrognoCIS EHR Software elegantly supports both capitation and FFS. It includes special features such as automatic write-off function for claims that are capitated. 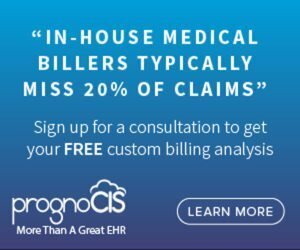 PrognoCIS also features an easy-to-use roster sheet which shows payments versus patients, allowing you to gauge your projected finances accurately.